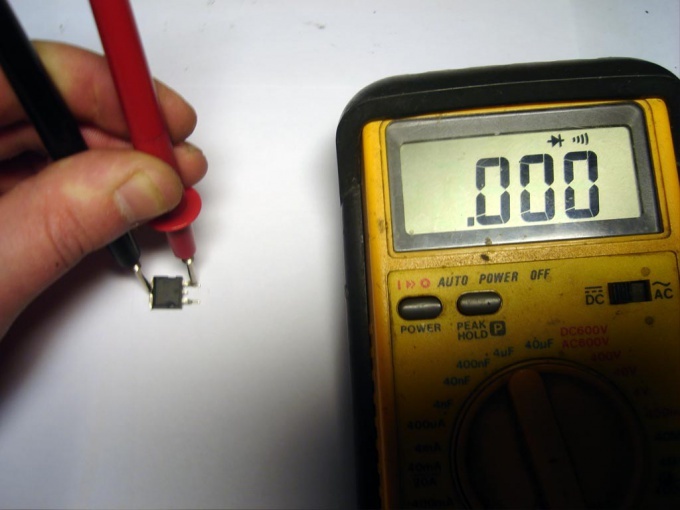 During the repair of electronic equipment are sometimes required to test a field effect transistors. These semiconductor devices in most cases operate as a powerful key device. Sometimes it happens that they fail. Test of field transistor, when it is soldered to the electronic circuit does not work, so before checking wipaire it. Inspect the enclosure. If the case has a hole from the melting of the crystal, test the transistor makes no sense. If the housing is intact, you can proceed to checkout. The vast majority of powerful field transistors have a structure of MOS-FET and n-channel insulated gate. Less common are p-channel, mainly in the terminal stages of audio amplifiers. Different structures of field effect transistors require different means for their verification. Vypav transistor, allow it to cool. Put the transistor on a dry sheet of paper. Insert the wires of the ohmmeter to the red positive connector and the black to negative. Set the measurement range to 1kω. The channel resistance of an open transistor depends on the voltage applied to the gate relative to the source, so in the process of working with a transistor, you can set a convenient scale. The connection of the electrodes inside the housing shown in the photo. Touch the black probe to the electrode of the source transistor, and the red touch the electrode "sink." If the device shows a short circuit, remove the test leads and connect all three electrodes with a flat head screwdriver. The goal is to discharge capacitive transition of the shutter, perhaps it was loaded. Then repeat the resistance measurement channel. If the instrument still shows a short, then the transistor is faulty and must be replaced. If the device showed a resistance close to infinity, then check the transition of the shutter. It is checked similar to the transfer channel. Tap any probe electrode of source transistor, and the other touch the electrode "shutter". The resistance must be infinitely large. Insulated shutter electrically connected to the channel of the transistor and any discovered resistance in this circuit indicates a fault of the transistor. The test procedure is fully serviceable transistor looks like this: Touch the black probe of the ohmmeter to an electrode of source transistor, touch the red probe of the electrode "shutter". The resistance must be infinitely large, and then, without closing the "gate" to other electrodes, touch the red probe electrode "sink." The instrument will show little resistance in this area. The magnitude of this resistance depends on the voltage between the ohmmeter probes. Now touch the red probe electrode Istok, repeat the above procedure. The channel resistance is very high, close to infinity. A method of testing MOS-FET transistor p-channel is characterized in that the measurements need to switch the red and black probes of the ohmmeter.